We are all aware that God is our Creator, our Father… the source of all life; and how the source of all life and creation is God’s powerful love… so great it could not be contained… that God simply had to give life because that is what love does by its very nature. So, as Catholic Christians, rooting ourselves in the creation story from Genesis, we focus on all creation and life as a gift from a loving God. We present God as full of loving energy that is so great it cannot be contained, so God creates persons in the divine image who can enjoy, appreciate, respond to and pass on the loving, creative, life-giving energy that makes God who God is. We speak of God as creating freely out of love and instilling the freedom-to-love in the human heart and mind because loving freely makes us most like God, makes us more and more in the image of God. We speak of our being made in God’s image and reflect on how we can be like God: making choices that are loving and life-giving rather than self-serving and deadly to ourselves and others. We speak of the sacredness of life and creation. We speak of how we can imitate the actions of God as loving creator who wants what is best for all creation. A term that is used to describe our role in life is the term “co-creator.” God has created us with the power to give life. But we are to do that always in partnership with God (“co”); we don’t do it on our own. And we do it in the manner and from the loving stance that God does it. Once life is begun, we treat it reverently. We protect it from harm. We nourish it and help it to grow so that it reaches its full potential. These are the responsibilities we have as co-creators with God. Of course the other model we have in all this is Jesus. He saw life as sacred and spent his life helping people to see their lives as God’s gift to them; as something to hold sacred. Jesus hands on to his followers (us) the mission to continue promoting the sacredness of his Father’s gift of life. We are to be co-creators, handing on and “duplicating” what God did “in the beginning” and has been doing ever since. God’s gift. For that very reason, the church has developed teachings about the gift of life and about specific issues that arise in our personal lives and in the social context of the society we are a part of. The church roots itself in the scriptures when it teaches and then applies the values contained in the scriptures to specific issues that arise over the centuries. The church’s teaching on basic matters remains constant but its application in specific circumstances and over time develops and gets nuanced as new insights emerge from science and from the deepening of faith in the community. So we will look now at issues related to life and consider how the church looks at these issues and what our response to them is. The Catholic Church has a consistent ethic of respect for all life from the moment of conception until the moment of natural death. The Church’s teachings on matters of life and death stem from the deep seated belief that God is the author of all life and, therefore, all life belongs to God. It is only logical, therefore, that no person has the right to willfully take from God that which God has created. The fifth commandment states “Thou shall not kill.” This commandment involves far more than the taking of life through murder. The taking of life through abortion, euthanasia, capital punishment, even war in some cases, and through drug and alcohol abuse also falls under this commandment. 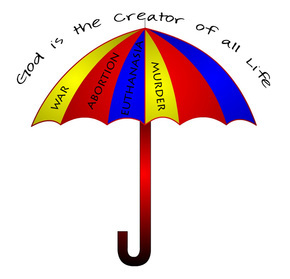 Above is a graphic of an umbrella emblazoned with the words, “God is the creator of all life." We will use this image to help us understand what God has created belongs to him. 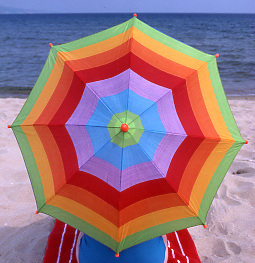 It all falls under His umbrella. We will now name the spokes that are contemporary problematic issues which related to life. -Murder is obviously not allowed because God, not man, is the author of life and all life belongs to God. The only exception to this rule is if one were to kill in an act of self defense. - LAST RESORT -A just war can only be waged as a last resort. All non-violent options, such as negotiation, trade embargos, economic sanctions must be exhausted before the use of force can be justified. -LEGITIMATE AUTHORITY-A war is just only if it is waged by a legitimate authority. Even just causes cannot be served by actions taken by individuals or groups who do not constitute an authority sanctioned by whatever the society and outsiders to the society deem legitimate. -RIGHT INTENTION-A just war can only be fought to redress a wrong suffered. For example, self-defense against an armed attack is always considered to be a just cause (although the justice of the cause is not sufficient--see point #4). Further, a just war can only be fought with "right" intentions: a war cannot be waged to gain land or power or to wipe out a people due only to hatred. -REASONABLE CHANCE OF SUCCESS-A war can only be just if it is fought with a reasonable chance of success. Deaths and injury incurred in a hopeless cause are not morally justifiable. -PROPORTIONALITY-The violence used in the war must be proportional to the injury suffered. States are prohibited from using force not necessary to attain the limited objective of addressing the injury suffered. - Civilians are never permissible targets of war, and every effort must be taken to avoid killing civilians. The deaths of civilians are justified only if they are unavoidable victims of a deliberate attack on a military target. In a “just war” no one may knowingly attack a school, orphanage, hospital, etc. In addition, the Just War Theory states that under no circumstance may any party use biological, chemical or nuclear warfare. It also states that the conscience of both the dissenter who refuses to kill and the soldier who goes into battle must be respected if their decisions were made in good conscience. -Abortion , the stopping of life pre-birth is not allowed because the Church believes that life begins at conception. If life begins at conception and all life belongs to God, then man has no right to end what God has begun. The Church does not give credence to the idea of “viability” that many in the secular world use as an argument on the Pro-Choice side which says that since the fetus is not viable, i.e. cannot exist on its own, independent from the mother, it is not yet a person. The Church tells us that the growing fetus is, indeed, a person and that the time in utero, is only one stage of a person’s life, no different in value and dignity, than later stages when the child is out of utero. The Church also points out that there are times when a fully grown person is not “viable,” i.e. when a person is dependent on a feeding tube, or ventilator to keep him alive for a time. No one would suggest that such a person were not fully human and, therefore, could be disposed of. The same, then, holds true, for the growing fetus. -Euthanasia, sometimes called mercy killing, is the taking of a person’s life in response to that person’s request, usually as a result of severe pain and suffering near what would be the natural end of life. The Church does not allow euthanasia because, since all life belongs to God, no one has the right to stop a life. -People have been erroneously put to death who were never guilty. -Drugs and Alcohol While the Church certainly does not condemn occasional and safe drinking of alcoholic beverages, it does ask us to look at the seriousness of dangerous patterns in drinking and it prohibits the use of non-prescription drugs, just as the government does. Because God has created our bodies, and because as Catholics we believe that we have some responsibilities for and towards others, we have a responsibility to take care of our bodies. For example, a pregnant woman who takes drugs (depending on the drug) is doing, at the very least some harm to her baby and could be doing irreparable harm. A person who has taken no steps to curb dangerous use of alcohol/drugs could cause himself to experience an early death, thereby robbing his family of his presence in their lives and, on a deeper level, of the man he could have been for them. Therefore, this becomes, on some level, a form of killing. In asking us to live up to such high standards of living, the Church stands beside us to offer help. Aware that many of these issues involve complex human emotions and difficult decisions, the Church does not leave us alone, but extends itself in every way possible. For example, the Church runs orphanages for mothers who wish to place their babies with other families, it runs compassionate retreats for women who have undergone abortions and are subsequently dealing with regret and/or guilt. The Church provides priest chaplains who go to war with soldiers and minister to them as they experience the horror of war. The Church runs hospice centers which sends caregivers either to the hospital or the home to help make the last days of a suffering person as comfortable as possible and to help them retain their dignity and their spirit. GOD IS THE AUTHOR OF ALL LIFE AND, THEREFORE, ALL LIFE BELONGS TO GOD. Being co-creators with God and responsible for maintaining and fostering the sacredness of life is an awesome responsibility. But it is ours. Fortunately we are not left to our own devices to carry it out. We have the gift of Jesus’ Spirit to strengthen and guide us. We have the church to enlighten and support us. We have our own prayer to keep us honest and clear and faithful so that we can do our part to help God’s dream for us come true.